Diabetes mellitus is a major health problem in the world. The total number of diabetic’s population is increasing every year. Currently used treatment of diabetes mellitus type 1 by controlling the blood sugar levels, doesn’t prevent complications which associate diabetes. The stem cell based therapy for diabetes aims to replace the diseased or lost cells of the pancreas with new cells using pluripotent or multipotent stem cells. Scientists successfully produced insulin secreting cell from different types of stem cells. In this article we briefly reviewed the progress made in the stem cell research for diabetes treatment. 1. However, there are some insulin application mechanisms under experimental development since 2004, including a capsule that passes to the liver and delivers insulin into the bloodstream Daneman, 2006 . And Vaccines for type I using glutamic acid decarboxylase (GAD), but these are currently not being tested by the pharmaceutical companies Aanstoot et al., 2007 . Data from 1994 to 2007 was analyzed and it revealed that the mean number of diabetes medications per treated patient increased from 1.14 in 1994 to 1.63 in 2007 Soltesz et al., 2007 . Pancreas transplant can restore proper glucose regulation Larsen, 2004 . According to the International Pancreatic Transplant Registry up to December 31st, 2010, more than 35 thousand pancreas transplants had been done. The primary complication related to pancreatic graft loss is technical failure, surgical complications, metabolic complications like acidosis and dehydration intestinal leak,infectious complications Meirelles Junior et al., 2015 and accompanying immunosuppressant required after transplantation may be more dangerous than continued insulin replacement therapy. Pancreas transplantation is efficient in people with extremely labile type 1 diabetes mellitus Armita Mahdavi Gorabi, 2016 . Islet cell transplantation may be a good option in those people with type 1 diabetes poorly controlled with insulin Bottazzo et al., 1974 . Difficulties include finding of compatible donors, getting the new islets to survive and the side effects of medications used to prevent rejection Naujok et al., 2008 . Success rates of technology were 44% of transplant did not use insulin for 3 years Bottazzo et al., 1974 . The Edmonton group in 2000 established the “Edmonton Protocol” and demonstrated sustained long-term insulin-independence Powers, 2008 . The islet cells were isolated from cadaveric donors Azarpira et al., 2014 , and injected into the recipient’s portal vein. The initial beta cell mass was reduced due to instant blood mediated inflammatory reactions, immune reaction to transplanted cells and diabetogenic effect of immunosuppressive drugs. Therefore, repeated episodes of cell transplantation was needed to achieve good results Agarwal and Brayman, 2012 . Multiple transplants are needed to reduce insulin shots because a thrombotic reaction occurs immediately when isolated islets are exposed to ABO compatible blood Bennet et al., 1999 . Blood clots entrapping islets may impaire insulin production of the transplanted islets due to shutting them off from oxygen and to attracting immunocytes Bennet et al., 2000 .Therefore, Scientists explore the possibilities to generate pancreatic cell from stem cell. The stem cell based therapy for diabetes aims to replace the diseased or lost cells of the pancreas using pluripotent or multipotent stem cells Abdulazeez, 2015 . Stem cells are highly specialized cells that make up the body tissues and organs. During life the body continues to rely on stem cells to replace injured tissues and cells that are lost every day. Stem cells have ability to self-renew and differentiation Slack, 2000 . Different types of stem cells such as embryonic stem cells, mesenchymal stem cells and induced pluripotent stem cells (IPS), had been successfully differentiated to insulin producing cells Soria et al., 2000 ( Figure 1 ). Embryonic stem cells (ESC) are isolated from blastocysts and can differentiate into endoderm, mesoderm and ectoderm cells. They can also differentiate in to insulin producing cell, these cells are able to release insulin in response to glucose stimuli and to normalize the blood glucose levels when transplanted into the diabetic mice Naujok et al., 2008 . Human ESCs can be differentiated into endocrine cells but there is a risk of promoting the development of tumors Kroon et al., 2008 . Groups of researchers used mouse and human ESCs and indicated final cell homogeneity, immaturity of the differentiated cell, low numbers of insulin-producing cells and a poor insulin response when the cells were exposed to glucose Abdulazeez, 2015 . Using human ESC-derived pancreatic precursor cells to treat patients with T1D is on experiment where the cells are encapsulated in a drug delivery system developed by the Encaptra Company. The system is administered under the patient’s skin to be protected from the recipient’s immune cells Ilic et al., 2015 . Due to the nature of its origin, the ESCs are the target for the ethicists, since they are derived from unused or unfertilized embryos at in vitro fertilization clinics which should be on the basis of informed consent of donor before using them for any clinical study. However, in most of the cases the cells from the embryo are obtained by destroying the embryo which raises a question about the origin of life and ethical rights to destroy the embryo Abdulazeez, 2015 . The discovery of induced pluripotent stem cells (iPSCs) in 2006 opened a new possibility in generating replacement cell based therapy Takahashi and Yamanaka, 2006 . IPSCs like ESCs have infinite self-renewal capacity and great potential to differentiate into a wide variety of cell types Yu et al., 2007 . Un-differentiated iPSCs can be maintained as cell lines; this provides great promise for disease modeling and allowing the generation of personalized stem cells for autologous cell therapies Jang et al., 2012 . Mouse skin fibroblast-derived iPSCs were able to differentiate into β-like cells, similar to normal, endogenous insulin-secreting cells that managed to control hyperglycemia in diabetic mice Alipio et al., 2010 . The human ESCs and iPSCs were differentiated into mature pancreatic cells which were capable of secreting insulin and C-peptide Zhang et al., 2009 . The iPSCs have been produced from patients with T1D and T2D Teo et al., 2013 . Insulin-producing cells have then been produced in vitro from iPSCs by directed differentiation, using small molecules and growth factors in culture Raikwar et al., 2015 . The advantage of using iPSCs is the absence of ethical concerns, and low risk of teratoma formation Kanemura et al., 2014 . The disadvantage of iPSCs is the reprogramming of somatic cells into iPSCs which is usually obtained by using viral transfection of transcription factors. The major limitation of this technology is the use of harmful genome which can cause mutations and prevent the normal function of iPSCs, their differentiation ability and may cause tumorigenesis Calafiore and Basta, 2015 . Friedenstein was the first person describes the isolation of MSCs from rat bone marrow (BM) Zhao et al., 2016 . Besides BM, MSCs can also be isolated from adipose tissues, fetal liver, cord blood, mobilized peripheral blood, fetal lung, placenta, umbilical cord, dental pulp, synovial membrane Nagamura-Inoue and He, 2014 , periodontal ligament, endometrium, trabecular and compact bone Dominici et al., 2006 . The International Society for Cellular Therapy (ISCT) has offered several minimal criteria to identify MSCs which are ; Plastic adherent fibroblast-like growth. Expression of CD73, CD90 and CD105 markers in at least 95% of cell population and lack the expression of CD34, CD45, CD14, CD11b, CD19 or CD79a and HLA-II markers, in addition to in vitro differentiation capability Dominici et al., 2006 . Under appropriate culture conditions MSCs are able to differentiating into mesodermal, endodermal and even ectodermal cells. They have the ability to release growth factors and transplantation immunoprotective cytokines. MSCs can be used for tissue regeneration and repair because they don’t form teratoma. Easy isolation, high quantity expansion and multipotential differentiation of MSCs make them ideal candidate for stem cell-based therapy and their application as gene carrier while their. Ablility to escape immune recognition and inhibit immune responses make them a very promising tool for immunomodulatory cell therapy in immune mediated diseases. There are currently 423 clinical trials using MSCs registered at clinical-trials.gov. The clinical trials have been conducted for tissue repair including cardiac ischemia, limb ischemia, amyotrophic lateral sclerosis, diabetes, ischemic stroke, osteoarthritis, liver cirrhosis and liver failure Zhao et al., 2016 . In these study human MSCs was intravenously introduced to NOD/SCID mice with total body irradiation or local abdominal or leg irradiation and the long term side-effect were investigated. They concluded that MSCs injection is safe and efficient for long-term treatment of severe complications after radiotherapy Francois et al., 2014 . MSCs have also been injected directly in the pancreas and being niche providing cells, these have helped alleviate diabetes symptoms by improving metabolic control in animal models counteracting autoimmunity, enhancing islet engraftment and survival or as a source of growth factors and cytokines Xu et al., 2009 . Injection of MSCs not only helps to improve pancreatic functions, but also heals associated symptoms like diabetic foot, nephropathy, neuropathy, etc. Although the effect of MSCs appears to be more generalized and most probably is a niche effect rather than true regeneration Bhartiya, 2016 . Spontaneous differentiation of MSCs in the host tissue is rare, therefore therapeutic use of MSCs depends on the ability to control their in vivo differentiation into functional cells with high efficiency and purity. An additional limitation is the potential of MSCs to differentiate into unwanted mesenchymal lineages, which may impair their therapeutic use. Several studies suggested the restriction of such unwanted differentiation by a variety of factors, however, this problem is still unsolved because the exact roles of these factors are not completely understood. Possible malignant transformation and cytogenetic aberrations of MSCs is also an Additional limitation Volarevic et al., 2011 . MSC is another cellular component of the BM and essential HSC niche component. Human BM-derived MSCs can be cultured long-term in vitro without losing their morphologic, phonotypical functional characteristics and with normal karyotype up to 44 weeks Welsh et al., 1988 . T cell-mediated immune response against newly-formed β cells is inhibited by MSCs from BM. Thus, stem cell therapy may be the best approach for treating T1DM patients Li and Ikehara, 2014 . Stem cells move to the damaged site, differentiate and induce structural and functional repair that help in cure of diabetes and normalize insulin level in the body Armita Mahdavi Gorabi, 2016 . In an in vivo experiment the mouse bone marrow cells were differentiated into functioning b-cells Ianus et al., 2003 . Other experiment found that IPC from BM-MSC rat normalized chronic hyperglycemia in diabetic rat Armita Mahdavi Gorabi, 2016 . Adipose tissues isolated from human lipoaspirates, also called adipose-derived stromal cells (ADSCs) can be accessed easily in large amounts and have differentiation capacities similar to BMMSCs. The harvesting and producing of AD-MSCs are more practical and less invasive in humans compared with BMMSCs, and can be considered as an alternative source of IPCs. AD-MSCs when cultured in media containing fibroblast growth factor expressed markers like Isl1 mRNA, which is essential for the generation of pancreatic islet cells Dang et al., 2015 . Several studies indicated that AD-MSCs from murine epididymis have the potentiality to differentiate into insulin-producing cells, which expressed PDX1, Ngn3 NeuroD, Pax4, Glut2, and secreted insulin and C-peptide. Recent study showed that AD-MSCs were differentiated into IPCs after 38-day co-culture with islet cells. 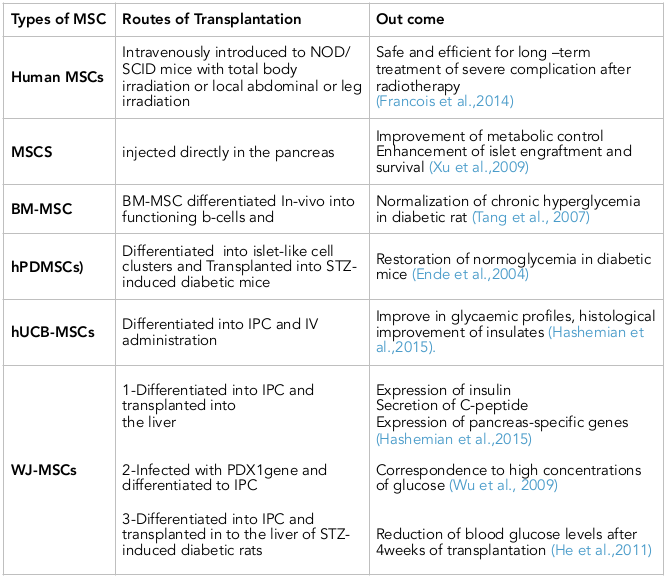 The merging of differentiated AD-MSCs and islet cells resulted in better recovery from diabetes compared to islets transplants alone or co-transplantation of islets and differentiated BMMSCs Hashemian et al., 2015 ( Table 1 ). Human Placenta-Derived MSCs (hPDMSCs) is an alternative source for cell therapy in diabetes Kadam et al., 2010 . Cells isolated from human chorionic villi of full-term placenta can form islet-like cell clusters (ILCs). Differentiated ILCs were found to express human insulin glucagon and somatostatin by immunocytochemistry. Transplantation of hPDMSCs or ILCs derived hPDMSCs in STZ-induced diabetic mice led to restoration of normoglycemia Ende et al., 2004 . MSCs isolated from cord blood Bieback et al., 2004 and hUCB-derived USSCs (unrestricted somatic stem cells) has a potentiality to differentiate into IPCs with same cell markers and properties as MAPCs (multipotent adult progenitor cells) Ende et al., 2004 Koblas et al., 2005 . The mononuclear adherent cells isolated from UCB show a BMMSCs-like immunophenotype and differentiation capacities.UCB cells exhibit genes essential for differentiation into pancreatic endocrine tissue (Isl1, PDX1, Pax4, and Ngn3) after culture in a medium supplemented with no specific cytokines or growth factors except fetal calf serum Hashemian et al., 2015 . UCB-MSCs-derived IPCs released insulin and C-peptide in response to a glucose challenge in vitro and in vivo Prabakar et al., 2012 . Improve in glycaemic profiles associated with histological improvement of insulates were achieved after intravenous (IV) administration of hUCB-MSCs to 25 NOD type 1 diabetic mice with insulitis.UCB-MSCs are available in large amounts, with low risk for immune rejection and have increased capacities for expansion and differentiation into IPCs can be considered as an alternative option for treatment of diabetes Hashemian et al., 2015 . MSCs in umbilical cord Wharton’s jelly (WJ) share the same capability of MSC from UCB to differentiate into IPC. Researchers successfully differentiate WJ-MSCs into IPCs and transplanted the IPCs into the liver of the diabetic mice. They demonstrated the expression of insulin in response to physiological glucose levels, as well as secretion of C-peptide and expression of pancreas-specific genes PDX1, Nkx2.2, HLXB-9, and Glut-2 Hashemian et al., 2015 . Later scientist compared the differentiation ability of WJ-MSCs and BMMSCs in obtaining IPCs phenotype. They indicated that both cellular types were able to form islet-like clusters on the first day in a preconditioned culture medium. In addition, they found a higher expression of PDX1 in differentiated WJMSCs compared with the differentiated BMMSCs, and the secretion of insulin and mRNA expression of insulin and C-peptide were higher in the differentiated WJ-MSCs. The WJ-MSCs infected with PDX1gene carrying recombinant adenovirus and then treated with inductive factors, could differentiate into IPCs in vitro. The differentiated cells expressed β-cell related genes like PDX1, Ngn3, Glut2, and Nkx6.1 and were able correspond to high concentrations of glucose Wu et al., 2009 . Another study demonstrated that WJ-MSCs differentiate into IPCs through a three-stage inductive protocol. They also showed that β-cell related genes were expressed in both differentiated cells and β-like cells transplanted in to the liver of STZ-induced diabetic rats through portal vein. As a result blood glucose levels were significantly reduced 4weeks after transplantation He et al., 2011 . The differentiated IPCs from human WJ-MSCs could alleviate hyperglycemia in diabetic mice Tsai et al., 2012 . These promising data suggest that WJ-MSCs possess the ability both in vitro and in vivo to differentiate into insulin-secreting cells. Due to more similarities of hUCB-MSCs, hPDMSCs, and WJ-MSCs to embryonic stem cells (ESCs), these groups of MSCs should be considered as potential cell therapy options rather than BMMSCs. With respect to the outstanding differentiation and immunomodulatory capacities of WJ-MSCs, conducting a banking system for both autologous and allogenic transplantation of these cells should be taken into consideration Hashemian et al., 2015 ( Table 1 ). Several studies suggested that pancreatic stem or progenitor cells existing within pancreatic duct cells are able to differentiate and migrate to form new islets during both organogenesis and regeneration Tateishi et al., 2008 . Stem cells isolated from pancreas can differentiate into osteogenic chondrogenic, and adipogenic lineages as well as expressing PDX1, Pax4, and Ngn3 transcription factors and have the potential to derive beta cells Seeberger et al., 2006 . Similarly pancreatic stem cells were successfully isolated from adult human pancreatic duct; these cells not only express nestin and PDX1 but also exhibit the identical markers of MSCs. In an earlier study it was shown that fibroblast-like cells residing in pancreas are multipotent cells capable of reversible endoderm mesoderm transition (EMT) just like MSCs. The endoderm mesoderm transition does not underlie the appearance of fibroblast-like cells in mouse islet cultures but that fibroblast-like cells appear to represent MSC-like cells akin to MSCs isolated from bone marrow Hashemian et al., 2015 . The clinical trials have demonstrated the effectiveness of MSCs in the treatment of T1D. Despite the success of differentiation of human MSCs in vitro into functional pancreatic cells the rate of trans-differentiation was considered low and the duration of functional maintenance in vivo is difficult to evaluate. The absence of standardized protocols for the expansion and generation of insulin secreting cells still leads to in consistent clinical outcomes. These interesting finding may provide a new insight into the use of MSCs based therapy for diabetes. MAPCs Multipotent adult progenitor cells. UCB Human umbilical cord blood. All authors equally contributed to this manuscript, included wrote, corrected and approved this manuscript.